Uncategorized – Page 31 – Tekin – Smaller, Smarter, Faster! Taylor Petersen is Tekin powered and ready to take on the competition! Come see Tekin’s Taylor Petersen, Jeremy Potter, Ty Campbell and even the Prez this weekend in Lewiston, ID. The European indoor race takes place yearly at an indoor facility in a town called Charlerio. It’s a technical indoor astroturf track open to club member 24 hours a day for practice so there are a lot of fast local guys. There are also a lot of top drivers that attend from the uk, germany and france. Its the first time ive been there and I felt pretty slow when I arrived compared to the locals! There was a serious amount of running too! 1 day of free practice and then 8 qualifiers and 6 finals in both classes so the motors were worked hard! I won 2wd which I’m quite pleased with considering my qualifying wasn’t great ending up 6th on the grid! Tekin DOMINATES the Electric Indoor Super Regional’s !!! The Warehouse Indoor Raceway in Helena Alabama hosted the Electric Indoor Super Regional’s this weekend. With close to 100 entries from all over the country the racing action is proving to be top notch! The largest turnouts were in Electric Pro Buggy and 2wd and 4wd Short Course classes. The Electric 1/8 Buggy class had some standout talent from different parts of the region. Martin Harrison from Louisiana, Ryan Lopez from Georgia, and Alan Burton from Alabama are all in attendance and setting the pace for the class and running Team Tekin Equipment. 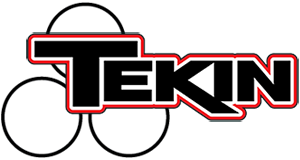 After quick interviews with these guys it looks as if Ryan(Team Losi) is running a Tekin 1900kv, Martin (Team Tekin, JConcepts, and MaxAmps) also using the Tekin 1900kv, and after 4 rounds of qualifying in elec buggy Alan Burton (Team Serpent) set TQ opting to use the Tekin 1700kv motor for his Serpent Cobra 811E. This weekend had some extreme cold temperatures which made tire choices a complicated decision. The traction changed from one run to another. After 4 rounds of qualifying Martin Harrison set TQ in elec Truggy using Tekin 2000kv motor along with Jconcepts 7’s as his tire choice and MaxAmps 6500 batteries. Michael Malott wins big at the 2nd Annual Indoor SC Truck champs! 2nd Annual Indoor SC Truck champs race was hosted at Reo Raceway in Rockport, IN. The 17.5 Spec SC class has been the biggest class for the past year and a half at Reo Raceway and this past saturday night was no different. Their were 56 17.5 Spec SC trucks in attendance with some of the fastest guys coming from Indiana, Illinois, Kentucky, and Tennessee. I bought my old FT SC10 back from a friend on Thursday night and worked all night Friday and Saturday morning to get the truck ready to go to try and compete for the win and the $250 that was on the line for this race. I installed a new Tekin RS with a Redline 17.5 and mounted up a few fresh sets of AKA SCT tires. I got the truck finished up on Saturday and put about 10 minutes of practice time in before the quals started. The first qual started and I was still getting used to the truck and made a few small mistakes that put me towards the back of the B qualifier after the 1st round. I was able to get a a little practice in between rounds and tried a couple different sets of tires and finally made my choice of a set of new SS Gridirons all the way around. Since the turnout was so big they decided to cut it back to 2 quals instead of 3 so I knew I had to be on it in the second qualifier to put it in the A main. I started off the 2nd qual setting a blistering pace and half way through the race I was the only Corr truck to be on a 19 lap pace. I was having a good run going only to get caught up with lappers and have a couple bad laps and drop back about 10 seconds which cost me the TQ by .7 seconds. I was pretty bummed to miss TQ but I was happy to be starting up front and I knew I had the speed and the right tire combination going into the A Main. The 10 minute A Main started and I got out to a good jump. I settled into the second spot and just paced myself off the leader. We were setting a fast pace out front so I just played the waiting game and stayed on his bumper the whole race waiting for him to make a mistake. We started lapping the field about 4 minutes into the race and I knew I was in the right spot to make a late charge. With about 3 minutes to go I started to make my moves and applying a lot of pressure and showing him my nose at every corner. I had a very good line through the double-double and sweeper section and I knew if I was going to make a clean pass it would come there. When we got 2 minutes to go I made my move around the outside of the sweeper and pulled off the outside pass and was able to get the inside line on the next corner. Once I got to the lead I started pushing the pace and slowly pulled away at the end of the race eventually winning the race by over a full lap. My Tekin 17.5 gave me the power I needed to make the pass on the outside and my AKA Gridirons were dialed the whole main. In the E-Buggy class we had a small group and some new guys in the mix. The 1st qual started and right off the bat I knew I was in trouble as I made the wrong choice of tires. In practice I had ran Wishbones and they were awesome but as the track dried out a little they started to go away with the track. I just kept trying to make solid laps and ended up finishing 3rd for the first round. After the first round I decided to switch to the SS Gridirons since the track was drying out and I knew they were working good on my SC truck so I ended up running them in the 2nd qual. When the second qual got started I was flying right from the start and setting a blistering pace. I got in a groove about 3 minutes into the qual and started clicking off fast laps right after another and ended up putting in an awesome run and managed to take the TQ. The 12 minute A main started and I got out to a huge lead and in the first 2 minutes I got into lapped traffic. I was making my way through the traffic and had already built a 10 second lead on the field. I got into trouble with a lapper right after the quad jump and as soon as the marshall got to the car he picked it up and threw it down right in front of another car and be blasted me in the left rear and broke the camber link so I was done for the main. I was really dissapointed with how it happened but there is always next time. My OFNA hyper 9E was on rails when I got the right tires combo and I had the car to beat all night just had a little bad luck in the main. This was to be my first ever Snowbirds Nationals. I must admit that I was going in a little intimidated. Racing from 5am until after midnight on some nights sounded a little crazy to be honest. However once I showed up late Monday evening I felt a lot better. I got no sleep the first night as I was far too excited to hit the track with 2 cars I’d never driven. My WGT was not ready nor was my T.O.P TC ride for the weekend. I spent the first round making sure the team had what they needed to hit the ground running. Rd 2 was up sooner than I expected however EJ Evans from TOP made sure I was ready to run. Having no local racetracks with carpet let alone carpet with this much bite made for a very steep learning curve. Luckily for me I was running blinky stock and already knew the right ratio for the Tekin Redline 17.5 I was using. Qualifying began with the track slowly but surely getting more and more traction. People started traction rolling and having tight cars. Lucky for me EJ Evans from TOP Racing was there to keep me on the right path with my TOP TC rent a ride. My WGT car was expertly wrenched on by fellow Speedmerchant drivers Tim, Joel, and Steve . This allowed me focus on the team. Thanks guys! Team Drivers were looking fast right out of the gate exchanging Tq’s in nearly every round with fellow team drivers as well as privateer Tekin users. Tekin Driver Eric Anderson would Tq Stock TC with his X-ray. Josh Cyrul would Tq WGT running a Tekin RS Pro in his Cefx ride. Andrew Knapp Tq’d 1/12th GTP 17.5(blinky) with a Tekin RS Pro powered CRC car as well take Tq honors in 1/12th GTP 13.5. Mike Haynes would take his Tekin RS Pro powered Hot Bodies TCX to a Tq position in Expert TC 17.5. Clearly the Tekin RS/RS Pro was the speedo of choice for nearly every class tq’ing all classes except Mod Tc and Mod 1/12 GTP. Mains Day was here sooner than we knew it. The team was set to back up their Tq performances and win some hardware. First up was WGT with Josh Cyrul as Tq followed by Tekin Team Driver Mike Dumas. Josh would get a great start. For the first few laps Mike Dumas would slowly inch up on Josh lap after lap. He would get very close to Josh as they both started coming up to traffic. Both would get through cleanly however Dumas would tap allowing Josh to walk away leading from tone to tone. 1/12th GTP 17.5 would come to be known as 1/12th Blinky. This was a very exciting race to watch. Andrew Knapp would start from the pole and lead the entire race. Ej Evans though was not to be denied and pushed hard to catch Andrew. Kenny Lambert would also challenge for position with Ej. Kenny and Ej’s battle would slow them down enough to allow Andrew to walk away with this one. Stock Touring a.k.a Blinky Stock would be Tq’d by Tekin Team Driver Eric Anderson. EA laid down some of the fastest laps of the weekend in this class with this Tekin Powered X-ray. Eric however would get blasted on the first turn dropping him all the way to the back of the pack. The luck would be found by Austin Harrison and Dustin Lane. These two got away the cleanest and would battle for the top spot for the rest of the race. Dustin put on a late charge but would tap allowing Austin to take the win. Expert TC ran 17.5 boosted at this event. Tq Mike Haynes would get out in front early from his pole position and never look back. The battles would be from 2nd on down with the rest of the pack fighting for podium spots. 1/12th GTP 13.5 Expert class would see Andrew Knapp on the pole. Tekin Team Driver Mike Dumas sitting 2nd in his Tekin Powered Speedmerchant Rev 6 would be on Knapp’s bumper right off the bat. Mike’s constant pressure would eventually crack Knapp allowing for a great passing opportunity. Andrew would battle back and the pair would race down the straight away. Dumas had the inside line with Knapp on the outside one of the most exciting races of the day. Andrew would come down onto Dumas leaving him no choice but to hold his line. The two collided in one of the biggest off track incidents of the weekend! Dumas would come out the best landing on his tires and blasting back into the race. Knapp would fall back never to return to the top 3. This allowed Dumas to get back out and run on his own or so we though. Mike Blackstock would come out of seemingly nowhere to catch up to Dumas but would run out of time. Mike Dumas would take the win. 13.5 WGT: Josh Cyrul Tq and 1st place, Mike Dumas 2nd, Markus Mobers 3rd, David Erlich 4th, Mark Burt 8th. Mike Dumas 1st place, Markus Mobers 3rd, Donnie Lia 5th, David Erlich 6th, Andrew Knapp tq and 7th, Eric Anderson 10th. Andrew Knapp Tq and 1st place, Ej Evans 2nd, Kenny Lambert 3rd, Naoki Watanabe 5th, Sal Amato 6th, Larry Fairtrace 7th, Eric Anderson 10th. Mike Haynes Tq and 1st place, Mike Dumas 4th, Austin Harrison 5th, Steve McNichols 6th,Larry Fairtrace 7th, Ej Evans 9th, Eric Anderson 10th. Austin Harrison 1st, Sal Amato 4th, Eric Anderson Tq and 10th place. Brian Sullivan Tq’s and wins at the TLR Supercross! Tekin Team Driver Brian Sullivan Tq’s and wins Round 1 at the Team Losi Supercross. Brian used the Tekin Rx8 and T8 2650 geared 18/50 in his Hot Bodies Ve8. Tekin team driver Jason Smith takes 3rd place in Mod truck after tripple A mains. Jason was using a 10.5 in his AE T4.1 truck. Bobby Gately managed TQ Mod 4×4 Buggy using his Tekin powered AE B44.1 buggy. Bobby Tq’d 2 out of 4 rounds using a Tekin RS Pro and Redline 8.5 motor and 12.5 Hi Torq rotor. David Joor back on track with 1/10th offroad for 2011! “Last week Speedster Hobbies / The Clay Pit hosted the first RC Pro Electric Shootout in Cedar Park Texas. It brought several fast guys such as Mike Truhe, Chris Jarosz, David Joor, Kyle Skidmore, Dave Mangelsdorf, and Ron Atomic. With 10th scale picking up speed again with brushless and lipo technology becoming mainstream these days, this race had a healthy attendence of 160+. Shaun Dunlap wins the 1st Annual Toys for Tots race at PRCR! Shaun Dunlap has been on a winning streak in the North-West with his Tekin powered Kyosho cars. Shaun went on to TQ and Win the 2wd Modified Buggy and Modified Truck classes at the first annual Toys for Tots race hosed at PRCR raceway.